A message went out to the Program for Cooperative Cataloging (PCC) listserv announcing the appointment of the PCC Task Group on URIs in MARC. The Task Force was formed to “help fulfill our strategic objective to optimize library data for the web” (email from Kate Harcourt to PCCLIST, 8 September 2015). 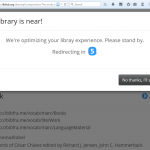 Those working in an OCLC environment may have already seen URIs in MARC. In order to transition to linked library data, the German National Library (DNB), regularly adds the MARC subfield 0 to access points in MARC bibliographic records. 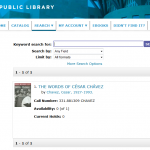 Below is a screenshot of OCLC record 827841368. The information in subfield 0 contains a code identifying the authority file in parentheses, immediately followed by the authority record control number for the vocabulary term. DE-588 refers to the German National Library’s Integrated Authority File–Gemeinsame Normdatei (GND), which is available as linked data. Subjects and names selected from authority files are the first obvious identifiers that might be included in bibliographic records; however, those aren’t the only terms selected from controlled vocabularies. Task Force charge #4 addresses “other” entities and relationships expressed in bibliographic records that would be better treated as identifiers. 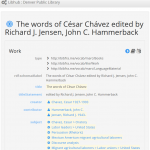 For instance, all RDA Relationship Designators (Appendices I, J, K, M, and eventually L) are terms that might be referenced with URIs, as all RDA element and vocabulary terms are available in the Library of Congress Linked Data Service and/or the Open Metadata Registry. The URI for “Sequel to“, as it might appear in a subfield i of a 7XX field, would become a machine-actionable link between the 1st book in a series and a 2nd book in a series. So much more of our RDA data (e.g., RDA carrier types or RDA media types) could be referenced by URIs. Next meeting: Prepping for BIBFRAME: It’s Time for a Remodel! This is the second in a two-part series on how libraries might start thinking ahead for BIBFRAME, a standard that is being developed to replace MARC. Much has happened since we last talked about BIBFRAME in October. The website underwent a reorganization, a BIBFRAME editor (for “record” input) was previewed at ALA Midwinter, early implementers are beginning to report on their experiences thus far, and the BIBFRAME Vocabulary and BIBFRAME Authorities specifications were published (note: all of the BIBFRAME documents should be considered to be in “draft” status). Comments from the community seem to be swaying away from the “this new model is too extreme to accommodate the granularity of our current data” view to “this new model is too conservative to carry our data into the semantic web” view. The concern that the architects of BIBFRAME are seeking to replace MARC rather than remodel bibliographic data in a way that utilizes modern web technologies (particularly in the areas of data exchange) is becoming more pervasive. Now seems to be a great time to discuss a remodel of our data. Does the scope of our data remodel require applying a new coat of paint or demolishing the whole structure and rebuilding from the foundation? How might we use new technologies to meet the fundamental principles of information discovery (and reuse)? All are welcome to participate! TOPIC: Prepping for BIBFRAME: It’s Time for a Remodel! Whether this concern is fair or not, it is a recurring theme throughout the ISQ Winter 2013 issue on the topic, “Evolution of Bibliographic data exchange.” Those who are interested in BIBFRAME and wish to hear an international perspective (from national libraries that already have experience implementing library/archives linked data) may want to read the whole issue.